Karl Schmidt Architecture,PLLC is a registered design firm that focuses on custom residential and small commercial design projects in the Pacific Northwest. As a residential architect in Seattle, we are dedicated to a rigorous design process that seeks to create innovative and sustainable architectural solutions that consider the uniqueness of site, program and budget both large and small. KSA has provided a high level design for families, business owners and select developers throughout the Pacific Northwest. Our personalized approach to working with clients makes the process enjoyable, inclusive, and fun. Involvement during the entire process of design through construction is critical to how we work. Working this way builds trust and ultimately great projects. It’s more than just a “style.” It is about how people live today—in particular the Pacific Northwest—Indoor/Outdoor spaces for use all year around, dramatic interior spaces that capture natural light, and smart homes that integrate technology and sustainable strategies. Regardless of the style of your home, be assured that our design process will uncover hidden possibilities that you may not have considered and will demonstrate the value of working with us. Identifying a sustainable strategy for your new home or Seattle remodeling project is important. The cost of energy is set to increase dramatically over the next ten years. Green materials, energy efficiency, water conservation, indoor air quality are among the many choices homeowners may consider. We can help you navigate the ever changing world of green building and lend you our expertise on what is current and what options best meet your budget. Good design is timeless – and it sells! Homes designed by an architect sell quicker and for more money than other homes. 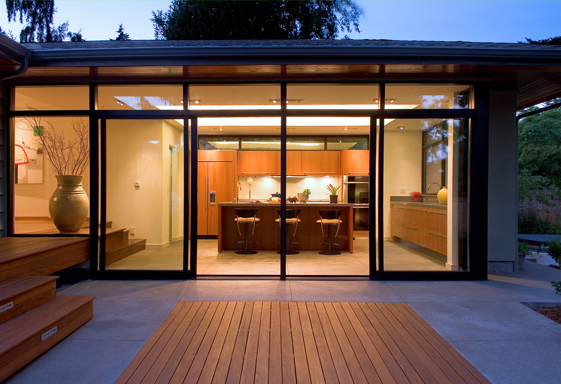 Wither it is a new home, remodel or addition, your project can benefit from the formal training of an AIA architect. After years of formal training and working in the offices of top architects we have developed a rigorous design process and a finely tuned aesthetic eye that result in design that has an enduring timeless quality. Have a question? Please call or email us for a free consultation. I can also connect you with some of the finest Seattle home builders! Visit our blog to gain valuable information on building resources, working with an architect, the design process, along with insights into the local design community in the Seattle area. Our Services and project type Include: Architecture, Planning, Interior design, feasibility studies, consultations with real estate agents, ADU (Backyard cottage), cabins, commercial tenant improvements, townhomes, rowhouses, apartments and condominiums. COPYRIGHT 2012 KARL SCHMIDT ARCHITECTURE: SEATTLE RESIDENTIAL ARCHITECT. ALL RIGHTS RESERVED.